Clients are used to waiting in line to get what they ask for: security lines in airports, long response times for repairing goods of any kind, getting put on hold on the telephone, or a timeline imposed by a subcontractor for the delivery of a computer application. In all these contexts, some waiting is expected. Yet wasting time is one of the main criteria to improve if we are to satisfy customers. Operae Partners helps its clients build processes that makes everyone save time (and money). 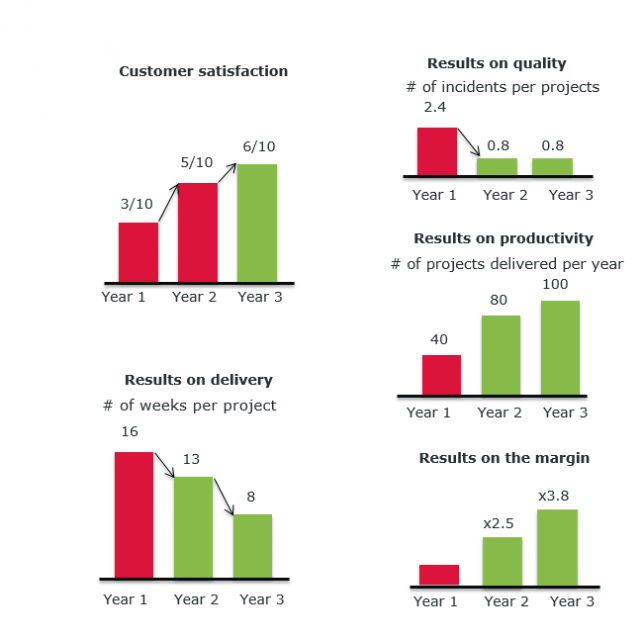 Here are two examples taken from our own Lean transformation projects in IT. In a highly competitive market, a telecom provider required his manufacturing partner to speed up the delivery of marketing campaigns, and that the campaigns be free of bugs. The manufacturing team who delivered the campaign configurations was taking 16 weeks, while experiencing a unusually heavy and unbearable workload. 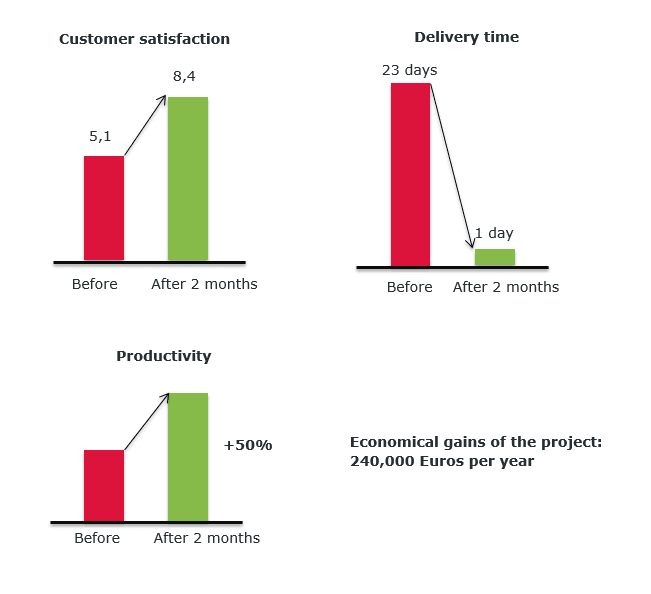 Thanks to Operae Partners’ coaching, the team cut its delivery time in half and reduced their workload dramatically. The team changed the way they worked in order to speed up the pace of delivery and improve the quality of their deliverables. Gradually, large projects went from 14-17 weeks to only 7-8. Shorter projects went from 11 weeks to 7 weeks, then 6. The manufacturer’s client, who had decided to change suppliers, was quite pleased and instead chose to increase their next order. Over a period of 3 years, the team succeeded in multiplying the number of delivered projects by 2.5 and multiplied their margin by 4. The team members also got their life back, as they were now able to go home at a normal time each day. A team in charge of configuring applications had a big (apparently insurmountable) challenge: to configure standard file transfers in 1 day instead of 23 days. With the support of an Operae Partners coach, the team succeeds in meeting this challenge in only 3 months. Originally spread out over several departments, the team was completely reorganized to ensure real collaboration. Once seated next to each other, the people in charge of performing the configuration and the people in charge of testing it were able to efficiently plan and manage their daily production based on client needs. The team started to deliver a specific number of complete configurations each day (as opposed to building “bits” of configuration as they did before). They succeeded in delivering what the client requested on a regular basis, and their productivity increased dramatically. In light of this immense success, the CIO decided to launch a Lean transformation program throughout the IT department.